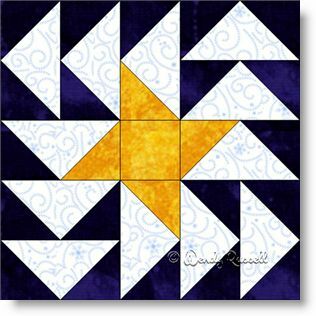 The Starlight Geese quilt block uses my favourite quilt patch -- the flying geese unit. I just like the geometry of the patch. The centre piece (the goose) is twice the size of the side pieces (the sky), but are cut differently in order to make the best use of the grain of the fabric. The block is considered to be a five patch as it is designed on a 5 x 5 grid, but the construction is done as an uneven nine patch. Since "Starlight" is part of the name of this quilt block, I chose to make the background fabric dark, to represent the night sky. However, your colour choice may be the opposite and that is fine too. One sample quilt illustrated, is set with the blocks side by side, separated by sashing of the same colour as the background fabric. This gives the effect of the blocks floating. The second quilt is set on point, also with sashing which gives the impression of framing the quilt blocks. There is no end to the possibilities of how to set the blocks for your quilt to make a totally different look. Enjoy!